Today’s enterprises are opting for the Agile and DevOps methodologies which have led to some intervention in the Software Testing Life Cycle (STLC) process with the concept of Shift-Left: the practice of integration and testing at every phase of the sprint with automated testing tools driving the entire testing process. Moreover, with the fast emerging technology trends like cloud, big data, security and mobility, the need of the hour lies in the innovation of automated tools and other migration solutions, that help deliver on-time quality products. Recently, HP has released Lean Functional Testing (LeanFT) tool during the HP Discover June 2015 that brings about ease and agility to the world of functional testing. Though the introduction of LeanFT tool seems to be effective news for those trying out new automation tools, but a lot of businesses might get worried about the possibility of how they would quickly convert their thousands of existing lines of code of HP UFT (Unified Functional Testing) scripts to be immediately used with HP LeanFT. In other words, enterprises using UFT might find it challenging to adapt to the new platform since the teams have already built test assets in the UFT. In order to make the migration easy, Cigniti Technologies has come up with a solution (QuickLean) which is the world’s first UFT to LeanFT migration tool. It converts your UFT scripts to be readily used with HP’s latest and advanced functional test automation tool – Lean FT.
QuickLean is a perfect tool led migration service that has been exclusively built by test tool automation experts from Cigniti Technologies in coordination with HP’s R&D team. It literally helps to jump start your UFT to LeanFT migration with this unique, first of its kind, automation migration accelerator solution. Moreover, there are many advantages with automated migration accelerators which have been listed below. There are many key benefits with an automated migration solution. Firstly, using automation, the migration process itself is accelerated on a full throttle mode, creating test assets which are standardized and hence it would be easy to maintain at a later point in time. Secondly, it needs very minimal knowledge transition and management oversight thus reducing overheads. Thus, it further ensures business as usual with minimal intervention during the actual migration process which is the most real time business benefit that enterprises are looking for today. Existing UFT Scripts – How can you migrate it to LeanFT? For existing UFT scripts there could be only 2 possibilities. You can either rewrite the scripts in LeanFT or use any automated tool to migrate from UFT scripts to LeanFT. But, rewriting the whole scripts in LeanFT might take longer time and is definitely a costly solution in terms of time and efforts. In addition, the testers should know either C# or Java to re-write the scripts in LeanFT which is time consuming. Instead, the ideal solution will be a tool that can migrate VB scripts to LeanFT scripts either in Java or C# that is easy and simple with Cigniti Technologies QuickLean, an automated migration accelerator. Now let us look at the QuickLean solution in detail. QuickLean supports diverse automation frameworks such as keyword driven, data driven and also functional decomposition. It supports multiple languages (C# & Java), heterogeneous data sources (Excel & SQL) and multiple application technologies such as web, windows and Java. QuickLean also helps migrate all types of object repository styles & also migrates entire test suites that reside in Quality Center/ALM to LeanFT. The solution also supports migration from any version of QTP or UFT to LeanFT. Moreover, it makes the LeanFT adoption for developers, testers and test automation engineers a cakewalk by automatically converting UFT test assets (Object Repository, VB Scripts and QTP Scripts) to LeanFT (Application model, C#/Java class files, LeanFT scripts). Why Choose QuickLean as a Migration Accelerator? QuickLean comprises of a full-fledged source file translator that converts UFT scripts to the target LeanFT scripts (C# or Java). Prepackaged libraries in QuickLean become a natural addition to HP LeanFT’s standard API ecosystem, providing an application model based object repository that maps UFT programming interfaces to corresponding LeanFT objects and methods thus easing the process of migration. This truly innovative test asset migration tool reduces the migration effort by 90%, speeds up the migration by 5 times and reduces the cost of migration by 10 times as compared to Manual Migration. 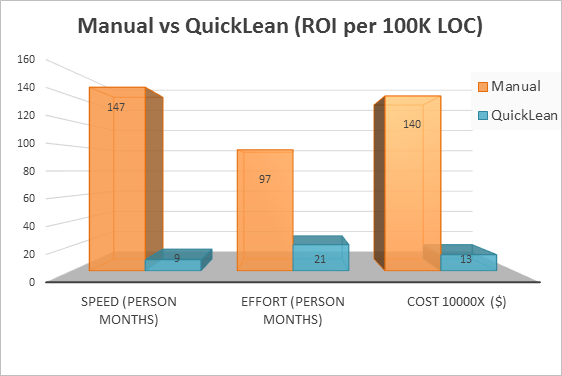 QuickLean solution built by Cigniti developed in collaboration with HP’s LeanFT product development team, is more cost effective either with speed or with cost than manual migration which has been depicted in the below graph. Within a month of its launch, Quicklean has successfully migrated over 187,488 lines of code using Hybrid Test Automation framework for a leading Healthcare IT Products company, 60,000 lines of code for a financial services company and a leading Pay TV operator in US. The automated conversion of test assets hovered between 85% and 90% and the rest of the migration was completed by expert migration team at Cigniti Technologies. If you are using HP UFT and would like to see how LeanFT can help you in your Agile & DevOps testing journey you should use QuickLean solution to accelerate your UFT test scripts migration journey to LeanFT. Cigniti Technologies has successfully performed more than 100+ WinRunner to QTP Migrations with WinQuick, in addition to Rational to QTP migrations with RoboQuick. And if you have any UFT scripts to be migrated to LeanFT, Contact us to know more and get easy migrations done with QuickLean solution. This entry was posted in LeanFT, Migrate to LeanFT and tagged automated migration accelerator, hp uft to hp leanft, LeanFT, leanft migration, Migrate to LeanFT, QuickLean, uft to leanft. Bookmark the permalink.